If you like beer, why not make it yourself? Tomorrow, November 3rd, is Teach a Friend to Homebrew Day. It’s cheaper to make an excellent two and a half cases of your favorite porter, lager, or IPA than it is to buy. All it takes is some basic equipment, good sanitation practices, and the ability to follow a recipe. If you can make a Betty Crocker cake out of the box, you can brew beer! I’ve been brewing for about ten years, with long lulls for darkroom building, other home remodeling, raising small kids, and other distractions. Still, I’ve managed to do about 14 or 15 batches in that time, and every batch I brew confirms how easy it is to do, and how satisfying it can be to hold that finished glass of beer in your hand, knowing you had everything to do with getting it there. With all of the batches I’ve done, I’ve ended up with leftover ingredients: hops, vacuum-packed and shoved into the back of the freezer; dried malt extract (or “DME”); adjunct grains with names like “Munich” and “Crystal”, sealed up in Ziploc baggies and piled up in the homebrew box in the pantry–you get the picture. The good news is that you can use many of these grains, hops, and other elements anytime, for another recipe. 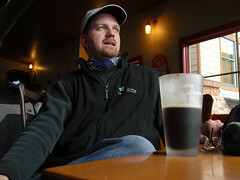 “porter” usually refers to a darker-looking, somewhat heavier ale. It isn’t too bitter, and shouldn’t have much of a hop taste or aroma. It is usually seen as “sweeter” than a bitter-style ale, and lighter in body than a stout. Think roasted barley, or the smell of a nice whole-grain bread coming fresh out of the oven, and you can imagine the taste of a porter. The following is a recipe, then, for what I call Leftover Porter. But the type of beer you make is entirely up to what sort of leftover stuff you’ve got laying around from previous brewing sessions. The point is to use it, and make something good out of what was just a pile of grain and dried flowers! The only thing I had to buy was the yeast (since I prefer liquid yeast, and it doesn’t keep). Crush malts in a ziploc bag, hammering them with a rolling pin (if they aren’t already crushed). This will help to release the sugars in the malts later on. Transfer these to a cheesecloth or mesh nylon bag (“hop bag”). Place the bag of malts into a stockpot with about 2.5 gallons of cold water. Bring to just under a boil. Remove the bag of malts. Reserve for the compost pile. Add your Dried Malt Extract and Calcium Carbonate. Mix in thouroughly. The DME will stick like crazy to your spoon, and clump (after all, it’s basically sugar). Be patient and stir it all in. Then bring the mix up to a full rolling boil. Watch to make sure it doesn’t boil over! Sticky wort on the stove is nasty to clean up. I keep a mug of ice-cold water nearby to damp down the foam as it gets too close to the top of the stockpot. Add the Cluster hops. Putting them into a hop bag will make it easier to remove all of them later on, but you can strain them out later, too, if you want. 15 minutes into the boil, add the irish moss. 25 minutes into the boil, add the Willamette hops. 30 minutes into the boil, remove the pot from the heat. Cool down to about 90 degrees or so. Pour the stuff (we call it wort) into a fermentation vessel, usually a glass carboy, 5 gallons in size. Top off to make 5 gallons. Use distilled water to avoid any contamination. When the temperature of the wort gets to about 70 degrees, pitch the yeast into the wort, mixing in without aerating it too much. Cap it with a hose running into a bottle of water, and sit it in a dark place where the temperature will remain at 68-70 degrees, for seven to ten days. slap on an airlock after the foamy stuff (“krausen”) finishes blowing out of the carboy and through the hose. After about ten days or so, you can transfer the wort to a second carboy via syphon, which will help make a clearer beer. But it’s not necessary. Wait until the liquid in the airlock bubbles less than once a minute or so, and then bottle your beer! Notes: I’m glossing over the importance of sanitation, and how to do it, and some of the details about how to “rack” your wort into the fermenter, etc. But any good homebrew store will sell you a book that talks about these particulars . The important thing is to experiment, using what you have on hand. And if at any point in the brewing process, you feel stressed, remember the brewer’s mantra: Relax, Don’t Worry, Have a Homebrew.